Lollipop Tree - Carnival Game Idea! Every Child Wins a Pop - Some Win a Top Prize Too! Lollipops Lean Down... BUT Work Fine for the Game! Before the carnival, count the number of grand prizes. Mark the end of the stick of one lollipop for each grand prize. Make sure the marked lollipops and evenly mixed in with the unmarked pops. 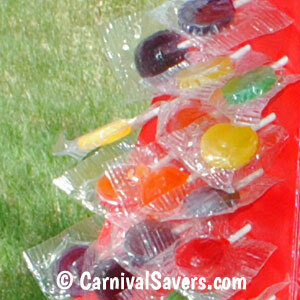 Place pops on the tree after you have your table set up and you are ready for your carnival. (Do not add lollipops to the tree and then try to transport the tree as the weight of the pops on the cardboard tree makes transferring difficult and pops seem to fall out! Note: At a school carnival we assisted with, we had 48 stuffed animals as a top prize for our lollipop tree. Our carnival lasted 4 hours so we put 12 winning lollipops in the lollipop tree at the beginning of each hour - just to make sure our top prizes did not disappear before the end of the carnival! Each player chooses a 1 lollipop from the lollipop tree. Each player gets to keep the lollipop they choose. But, if the lollipop has a colored mark on the end of the stick, then the player gets to keep the lollipop they picked AND a top prize! *Top carnival prize winners should be about 10% - 20% of all players if this game is set up for a fundraising carnival. If you are planning a carnival for the first time, this is an inexpensive and easy to set up game! We love that the winners are predictable and the cost of the tree is very reasonable for almost any church, school or fundraising carnival! For example, if you only have enough in your budget to purchase 24 top prizes, you know you will not run out as you will only mark 24 lollipops with coloring on the bottom of the stick and just add the winning pops to the tree throughout the carnival. Are you wanting to make a large homemade lollipop tree? Check out our DIY Lollipop Tree page for pictures of handmade trees typically made out of wood or pegboard. 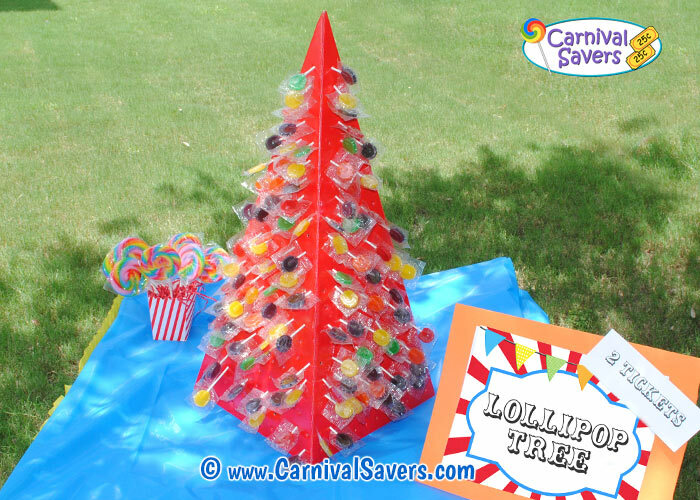 If this is for a winter carnival or Christmas Carnival see our brand new Holiday Christmas Lollipop Tree! Safety Note: This booth is popular for small children - you may wish to have individual bags of animal crackers on hand. If a toddler wins, let the parents decide if the little one receives the top prize or a bag of animal crackers (in addition to the lollipop they choose from the tree). 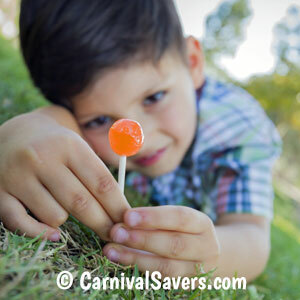 KIDS LOVE THESE YUMMY LOLLIPOPS & PRIZES PERFECT for the LOLLIPOP TREE! !